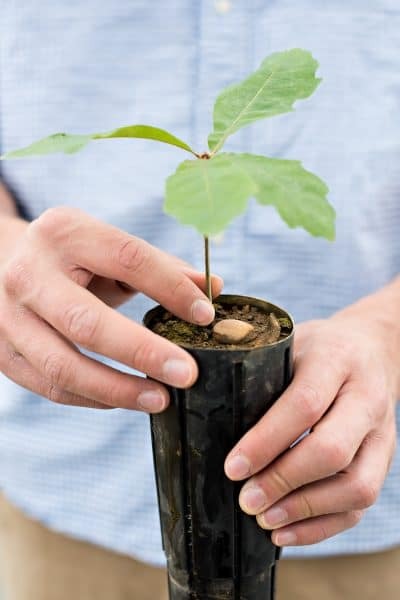 Heart and Soil Dashiell Dericks ’18 and Jesse Evans ’20 are selling saplings grown from Colonnade oak trees in a new business that marries Dericks' love of silviculture and his fondness for W&L. Dashiell “Dash” Dericks ’18 (left) poses with business partner Jesse Evans ’20 beside the oak tree saplings Dericks grew from acorns gathered on the Colonnade. Washington and Lee’s front lawn, bookended as it is by the iconic Colonnade and historic Lee Chapel, is frequently lauded as the most breathtaking view on campus, and one that alumni miss seeing on a daily basis. Now, two enterprising W&L students are making it possible for people to take home little pieces of this favorite spot — and even plant them on their own front lawns. Dashiell Dericks ’18, who counts silviculture as a longtime hobby, has grown about 30 white oak tree saplings from acorns he collected on the Colonnade in autumn 2016. He and his business partner, Jesse Evans ’20, are selling their “Colonnade Oaks” through the University Store, complete with a certificate of authenticity. Dericks, a native of Indiana who also happens to hold the W&L record in discus, grew up on a farm that was 90 percent forest. “I spent a lot of time wandering in the woods,” he said. As a kid, he read books about plant identification and developed a particular fondness for trees. On the farm, he perfected the task of growing seedlings. In fall 2016, while walking back and forth to classes on campus, Dericks noted the abundance of acorns on the front lawn. He gathered them, a handful at a time, and carried them back to his room in the FIJI house, where he placed them in the refrigerator to simulate winter conditions. Next, he planted the acorns in cones, using some Indiana farm dirt and some from the FIJI house yard. He placed the containers in his closet, which he had lined with aluminum foil and outfitted with a fluorescent light. Dashiell Dericks ’18 holds a Colonnade Oak. Dericks babied the trees throughout the academic year, even taking them home with him during breaks. His parents were “not at all surprised” when he turned up with a bunch of seedlings, he said. Dericks’ business partner, Evans, is not new to entrepreneurship. When he was an eighth-grade student in Jacksonville, Florida, he and his best friend started a dog-walking and pet-sitting business called Happy Hounds. He is still involved in the management of that company, which has four employees and 40 clients. This summer, he intends to start a web consulting business to assist customers with website design and social media. While Dericks grew the trees, Evans handled the marketing aspect of Colonnade Oaks. His first priority was to gather information about the trees from which the acorns fell. “I’ve spent a lot of time in Special Collections looking at books,” he said. Dericks and Evans also credit biology professor and department chair Bill Hamilton with supporting their idea. Hamilton allowed them to move the trees from Dericks’ closet to the university greenhouse, and he talked up the project at several alumni events. “He’s been pretty important to the whole process,” Evans said. Evans also worked with Meg Beebe, marketing and business manager in the University Store, to determine a price point ($55 per tree) and a sales and marketing plan. The store helped them put together informational pamphlets and certificates of authenticity to go with the trees. The University Store will take a cut from the sale of each tree, but the rest will go back into the student-run business. The trees are currently on sale in the University Store, and Dericks will set up a table on Cannan Green during Alumni Weekend. If purchased on campus, the trees will come in a pot. The students have also designed a way to package the trees so they can be safely shipped — they even test-shipped one to Dericks’ parents in Indiana. 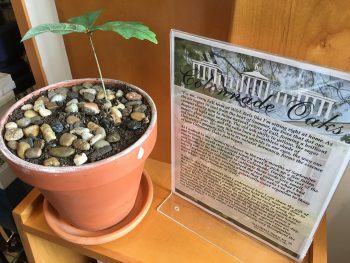 A Colonnade Oak is displayed in the University Bookstore. Chances are good that the first crop of trees will not last long, so Dericks and Evans are busy mapping out the next phase of the business plan, which will likely include taking orders for next year. They also hope to cultivate saplings from other tree varieties, including ancient maple and ash trees in front of Lee House. If you are interested in ordering a Colonnade oak, please contact the University Store at 540-458-8633 or email store@wlu.edu.